Though particle counting is reported as an actual count of the number of particles (of a given size, per ml of fluid), most specifications and limits simply refer to ISO codes. The ISO codes, according to the ISO 4406:1999 standard, relate to only three different ranges of particles, ≥4 µm/≥6 µm/≥14 µm. It should be noted that each range is equal to or greater than its designated micron rating, meaning that all particles counted in the ≥14 micron range will be included in the count for the ≥6 micron range, which in turn is included in the ≥4 micron range. As such, the ≥4 micron range is always the highest count, followed by the ≥6 micron range, then the ≥14 micron range. To convert the particle count into an ISO code, please refer to the example below. 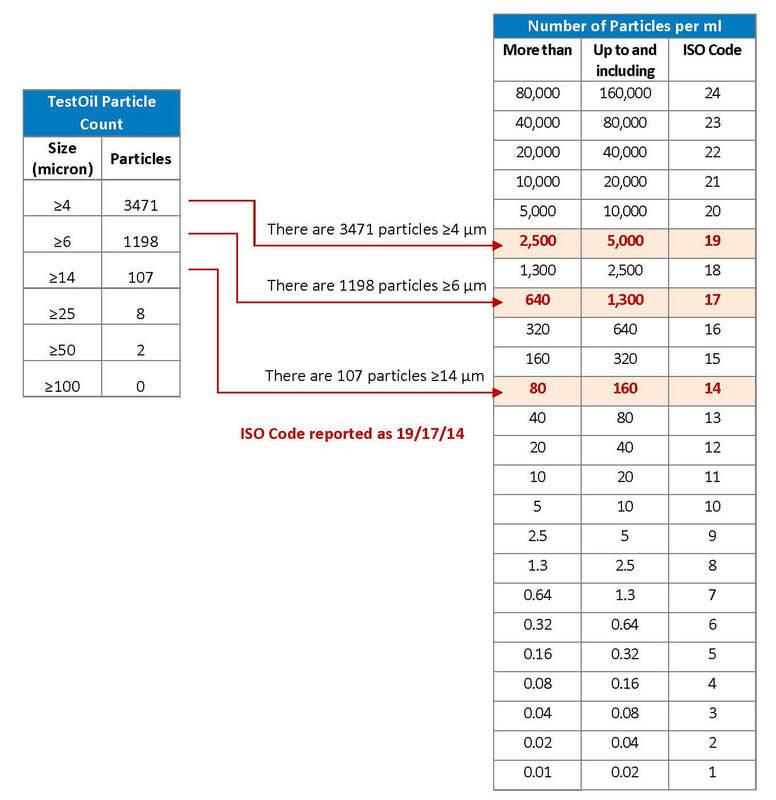 The original particle count is in the right-hand table, and the ISO codes are in the left-hand table. For each progressively higher ISO code, both the quantity and range of particles doubles. The essential problem with interpreting particle counts is that the values do not seem tangible, i.e. it is difficult to translate something like 3471 particles ≥4 µm into a physical quantity. By coding the results all that seems to happen is that one set of numbers is converted into a different set of numbers with less resolution, meaning they are simply grouped into broad ranges, but remain difficult to translate to a physical quantity. According to a study performed by Caterpillar, it takes approximately ½ teaspoon of particulate to contamination a 55 gallon drum of oil to an ISO code of 18/16/13. Returning to the example above, where 19/17/14 is one ISO code higher than 18/16/13 and therefore considered twice as contaminated, the result can be interpreted as approximately 1 teaspoon of particulate per 55 gallons of fluid. Considering new oil cleanliness is typically around an ISO code of 20/19/16 (give or take a code), which is 2 or 3 codes higher than the 18/16/13 reference, it can be appreciated that this equates to between 2 and 4 teaspoons of particulate in every drum of new oil, as received. This should serve as a reminder in the need to pre-filter lubricants for most applications. 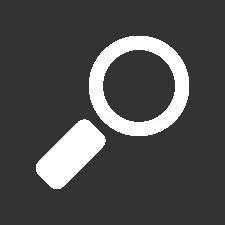 For specific information on other measured parameters, bookmark this page for future updates. Coming up next: Understanding Viscosity. As the Marketing Director for TestOil, one of my duties is to manage this website by keeping the content relevant and interesting to visitors. 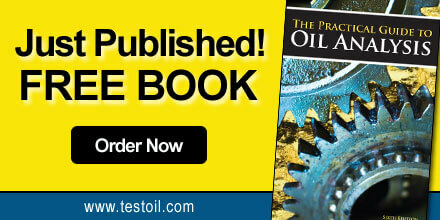 Please spend some time reading our blog posts and learning more about what we love to do...oil analysis. I sincerely hope you enjoy your experience! 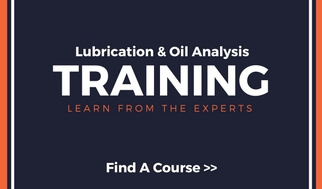 Why Don’t My Oil Analysis Results Correlate?